peer: İz, could you tell me about your project for The Moving Museum (TMM) Istanbul exhibition at Şişhane Park? What are you exhibiting? 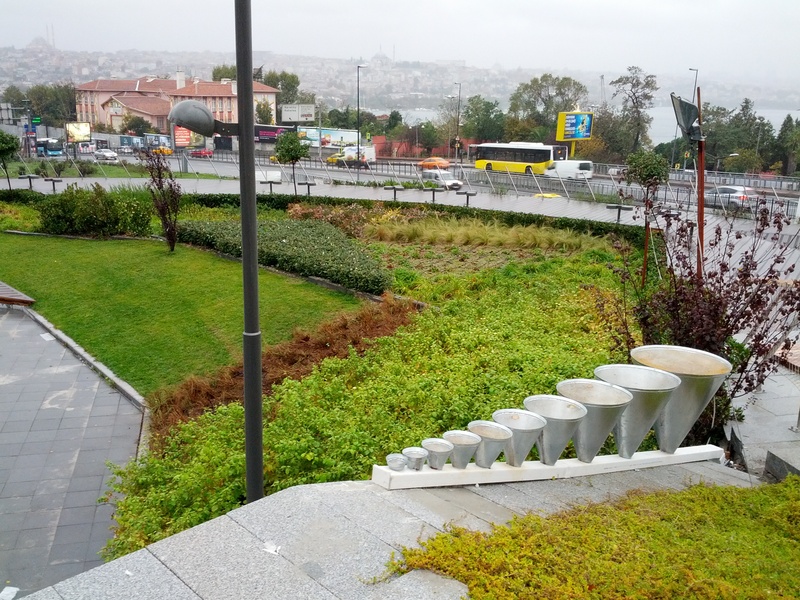 İz: I installed Sculpture for Rainwater Harvest on the roof of the exhibition venue, Şişhane Park, which appropriates approximately 106,5 kg of rainwater during the exhibition from a surface of 0.80 m2. The harvested water is stored inside the exhibition space and I will use it as raw material for a new series of works that will be produced after the exhibition. p: So, it’s a sculpture but it also literally does what it says in the name? An artwork with a function? İ: The sculpture harvests rainwater but as reflected by the numbers, it does so on a gestural scale. For our current discussion, it functions more as a speculative tool. Rainwater harvesting is an ancient practice, which has been widely used in Istanbul historically and could very well be widely practiced again. It aims to collect rainwater from a sloped surface, such as a roof, to store and to use on site. 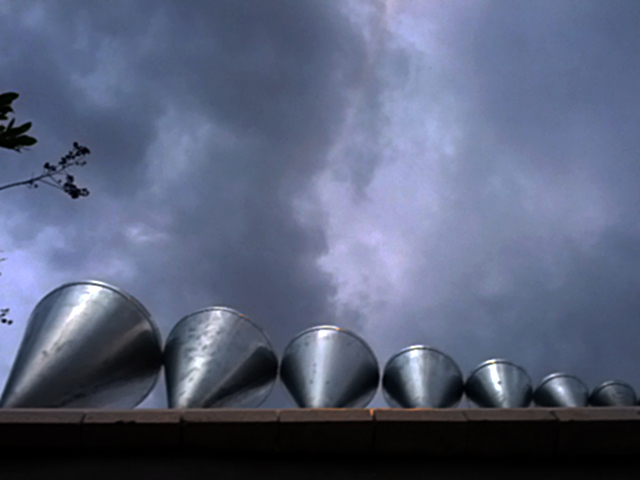 Sculpture for Rainwater Harvest functions in an irrational manner by funneling rainwater with ten cones of different sizes, which are installed in dialogue with the architecture. p: You describe what the sculpture does as appropriation. What do you mean by that? i: You picked up on my conscious decision to use the word “appropriate”, which enables me to speak about a few levels of appropriation surrounding the work. It is necessary here to look at the framework in which I realized the work. It is produced with the financial support of TMM İstanbul, which is a “community interest company” registered in England an Wales  allowing for a social enterprise to use its profits and assets for public good. The work is located in Şişhane Park, which is a private-public partnership with an emphasis on extending the public realm. Thus, the production and the visibility of the work is already appropriated and is complicit with a web of discourses that claim to contribute to public good with the profits gained by the same enterprise. In my dialogue with Alexis Şanal, one of the architects of Şişhane Park, I learned that “the site is engineered for rainwater collection to reclaim for landscape irrigation.” By installing the sculpture on the site, I am appropriating some of the water that would be harvested by Şişhane Park and using it in the production of artworks. The word “appropriate” also reflects how we relate to water as a resource/input to be utilized. In appropriating the water and producing artworks with it, I use it for commodity production and potential capital accumulation. But, in making the work, I find another way of appropriating the harvested water, in the sense of making it mine as I define how I relate to it. I plan to “use” the water to evoke its qualitative associations as matter; as a matter that dissolves, that heals… Could I appropriate it in a way in which water is not H2O but a matter that enables us to get rid of nightmares? p: Could you explain what you mean by “[water] as a matter that dissolves, that heals” and how does it enable us to get rid of nightmares? Let’s speak about rainwater as a commons; something all has access to and responsibility for. I am convinced that the most effective way of governing it in both rural and urban environments is harvesting it on the site, where it falls. So, when it falls on the surface of a park, designed as a space for public use but has private ownership for thirty years, who owns the harvested water and how should it be governed? p: You mentioned “governing”, which is also the main question regarding the discussions on the commons for me. Here you, as an artist, govern the harvested rainwater and decide on its faith to become a private artwork of yours at the end. Before your intervention, Şişhane Park, which is a “public private partnership” as you mentioned, was governing the amount you would harvest. And they decide on its faith to be used for landscape irrigation of a public space. If you look at it this way, what Şişhane Park does as a vertical (rain)water collecting method, the rainwater harvesting, may not be considered appropriating the “commons”, but what you are doing is so. Do you mean that? My problem here is that; as a peer—that is what I would like to call myself besides being “public”—, have no right to govern any artwork you will produce with the harvested water, just like I have no right to govern the public park and the plants in it. It would be called “the tragedy of the commons”, if I choose to govern it by taking the plants to my house, to my private space for my own benefit. Or I may choose to govern it by planting other plants there. Maybe I believe that I am very knowledgeable about landscaping and I think some other plants could suit the park better. I do not have the right to do that either. Of course, I may ask or suggest both options to the party governing it. And if I am not happy about the way they govern it, I may vote for other authorities in the next election, or get into politics if I think that there is no other party that can govern it in the way I would be able to appreciate. This is the kind of democracy we are experiencing within the nation state system, which has also been appropriating the commons in a sense. İ: Could you say why you consider rainwater a commons? But, what do you consider it? Whose property are you appropriating? İ: Leaving aside the ownership, I find it important that rainwater is harvested on site and decreases the dependency on the water services provided centrally by the state, which involves transporting water from nearby dams. p: You say that you appropriate the rainwater to produce artworks. So, will these works which will focus on the way you relate to water as you mentioned above, be a part of TMM Istanbul exhibition as well? İ: The water collected by the sculpture will be the raw material for works to be produced after the exhibition. The sculpture is a tool that enables a process to come after the exhibition. It promises a potential that cannot be seen yet. p: You also mentioned dams, what I would call a “horizontal” water collecting method. How do you approach dams and other horizontal water collecting methods and how do you compare it to the vertical ones, like that of rainwater harvesting? I: I like your distinction and conceptualization of horizontal and vertical water collection, which enables us to think of the two practices; dams and rainwater harvesting in relation to each other. Yet, while reflecting on the direction of the movement and accumulation, let’s not lose sight of the difference in scale and motivations of the agents who exercise them. While dams are an ideological tool used by the state to extend its control horizontally over the landscape and the people by displacing / dispossessing for the purpose of economic growth, rainwater harvesting suggests autonomy from the state. Dams are giant interventions in the landscape that displace people, ruin the existing ecosystem and eventually expire. Rainwater harvest is practiced by individuals or members of a community, who use the harvested water on site for sustenance. 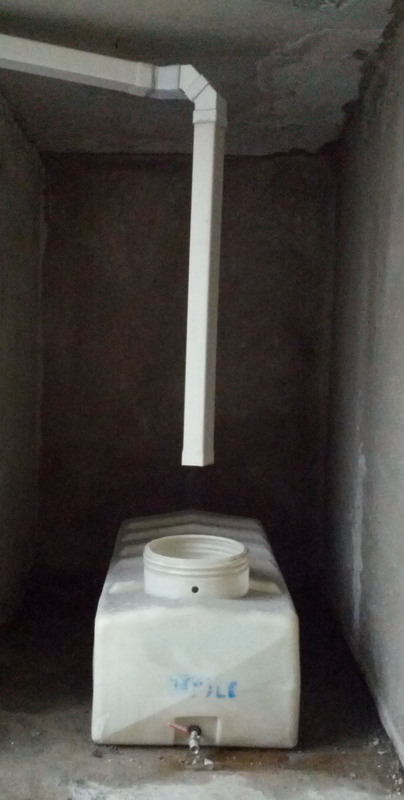 p: Rainwater harvesting is an ancient method as you mentioned but it also has become a popular concept in sustainable architecture. Would you like to elaborate more on this issue and what it means for you to install the Sculpture for Rainwater Harvest on Şişhane Park, which already incorporates this practice? İ: Reflecting on the incorporation of rainwater harvesting as a practice in architecture brings me to the distinction between sustainable development and degrowth discourses. Sustainable growth discourse can act as a façade behind which the neoliberal logic of production and consumption keeps flourishing. It renders invisible the necessary radical changes that acknowledge the limits of nature. Since you don’t give a specific example, I don’t know if you are referring to architectural practices that radically rethink forms of living in relation to the environment or only incorporate cost-efficient alternatives to erect a façade of sustainability. Placing the sculpture on a site that is already harvesting water actually turns us into rivals; “originally a neutral term used in Roman law to designate a neighbor sharing with another the waters of a rivus.”  Or, possibly, I draw attention to the rainwater harvesting practiced by Şişhane Park by placing the sculpture there and contribute to their claims of public good. p: Rainwater is commons according to what I will explain below. But it is appropriated in many ways as soon as it falls, either privately or publicly. I feel an urge to expand the ideas behind the commons to the contemporary situation but with a new vocabulary. Besides public/private ownership dilemma we are stuck in, I came across a different property regime in the Roman Law for example. To be honest, I do not have personal research on this but what I understand from many references is that there are many types of property definitions in the Roman Law that are not/cannot be privately owned. We refer to most of these as “public” now. What I find important and distinguishing among the different types of property in Roman Law is the way they are produced and governed. For example “res communes” refers to naturally available things and they are usually governed by the community around them, neither by the state, nor by municipality, and definitely not by all the human in the world. “Res publicae” refers to those governed by the state, as what we call “public” now. I think some naturally available sources could also be “res publicae”, but I would like to take this category as what is produced by the state besides what is naturally available. At least the state produces some structures to govern it. There are other types of property as well. For example there is usually the municipality, the city involved in “res universitatis”, instead of the state. I think this is like the status of the public parks in the cities now. So, the rainwater, which was “res communes”, would become “res universitatis” when it falls on a “res universitatis”. I wanted to explain these terms in order to explain what I understand from the commons upon your question. But I am witnessing another type of production and governance today which can be called the “commons-based peer production” as put by Yochai Benkler for Free and Open Source Software, or better as “peer production” as conceptualized by Michel Bauwens, inspired by the peer-to-peer computer networking but expanding it to a wider context. To explain this mode of production, ownership and governance we can look at the Debian GNU/Linux operating system. Debian was built mainly on the free and open source copyleft software by the GNU project and the kernel component by Linus Torvals, by the people who choose to work on the project by freewill. The copyleft attitude in free software is that, the software produced is released under a license such as GNU General Public License (GNU GPL), which states that anyone is free (here free refers to freedom, not gratis, this is very important!) to run, to make use of the program the way they like, to study and to modify it and also to redistribute the modified or exact copies of it. The modified versions must also be redistributed granting the same freedoms. This way the initial developers as well as everybody else, would also benefit from the improvements on the modified versions. This is called the copyleft attitude. This is a kind of giving back. Giving back not only to the community which produced it but also to everybody else. This is also a very important for the point I am trying to explain here. These days a group of hackers, who call themselves Veteran Linux Admins, are talking about “forking” the Debian project because they are unhappy with a decision made by the recent Debian project team. I do not know if some of these hackers have been contributing to the Debian project but they are talking about “forking” it so that they can govern it in the way they prefer. I think this practice of “forking” is what we need for another idea of governance beyond democracy. To put it short, forking in free and open source software is taking the source code of a project and developing and governing an instance of it with another name/brand, while still making use of the developments on the original project and also making their contributions available to everyone, including the forked project itself. Bauwens talks about “third modes” of production, property and governance for peer production. What he calls as “peer property mode” is neither public nor private property, but a third one. That it is a kind of property owned by everybody, all the peers. Not just by the producers of it or by the community around it but by everyone in the world. This is guaranteed with copyleft or non-copyleft free software/culture licenses. Even though Bauwens describes what he calls as the third mode of governance, “P2P governance mode” as the governance by the community of producers, I find it important to highlight that the “peer property mode” enables forking the project, thus enabling the governance of the fork by any party besides the community of producers. This enables a governance model where everybody can govern something without affecting the governance of others and also thanks to the copyleft attitude, the governing parties do not compete but collaborate (sometimes asynchronously) and make use of each others improvements. The peer production practice has become possible because of the developments in the information technologies. Digital information can be duplicated with a marginal cost approaching zero, as long as the intellectual property relations permits. There is no question of actual scarcity but an artificial one regarding the digital information. It is a non-rival good. One making use of it does not limit the use of others. The availability of digital representation of information challenges the capitalist ideas and even the ideas preceding it, like that of the commons. Peer production is not something naturally available like that of the commons; it is something produced by peers with freewill and with some kind of, let’s say, self-organization. It is freely (as in freedom) available trans-locally; not just where it was produced and not just for the community that produced it like that of imece  production. Instances of it can be governed by anybody, anywhere by forking it. Multiple governances do not have to compete and they even collaborate. Some people still try to describe these practices referring to the idea of the commons, like that of the “digital commons”, but I am for using a new vocabulary for these kinds of practices to inspire new possibilities. These practices have never been possible before as a system and they promise another world. Of course these practices belong to the realm of immaterial production but they can be very inspiring for expanding the idea of the commons in the contemporary situation and can influence our production, property and governance relations in every aspect of our socio-economic life. How can rival physical goods become non-rival? How can we govern these without affecting the governance of other parties. How should we constitute the multitude? İ: Since we used a work of art for departure point for this discussion, is it possible for you to give an example of peer production in the art context, where what is produced is freely (as in freedom) available for everyone? p: Any free cultural work (see www.freedomdefined.org for what is a free cultural work) grants the mentioned freedoms to everyone. Wikipedia and all other work of Wikimedia Foundation are examples of peer production in general. But I don’t prefer to refer to any particular work of art here. Free culture matters in long term, so any free cultural work can influence the birth of a new peer production work, anytime in the future. Whether produced by a single peer or in a peer production manner by the communication and contribution of many peers, I would call it peer production. Even if peers do not work together in a defined, organized way, but each producing a new free cultural work just by her/himself based on a free cultural work; the total of all those works would be considered peer production for me. Because they get inspired from each other and they are free and encouraged to build on each other’s work. Any work of art that is born digital, or at least constructed to be experienced as digital information suits perfectly for peer production in the long term. However the challenge is to speculate on the possibilities of when a work of art that requires to be experienced as a material, which will eventually be commodified under conventional circumstances. What excites me about art is this in fact. If we can speculate on some possibilities in art, then that may be inspiring for other aspects of life, maybe. The conversation took place between November 18th and December 16th, 2014. Öztat utilized some of the harvested water to make a series of watercolors in relation to the nightmares she encountered during her ongoing research on the commercialization of water. In a talk she gave on January 10th, Öztat discussed her research, using the sculpture as a speculative tool to reflect upon the context in which the nightmares occur. Departing from the folk belief that nightmares flow away as they are recounted to running water, she imparted her nightmares to the audience by giving away the watercolors. The video titled Recounting nightmares to running water emerged from this process and is dedicated to the public domain. İz Öztat (1981) lives and works in Istanbul. She is currently a candidate for PhD in Art Practice at Yıldız Technical University, İstanbul. Her selected exhibitions include ‘Conducted in depth and projected at length’, Heidelberger Kunstverein, Germany (2014); ‘Rendez-vous 13′, Institut d’art Contemporain, Lyon, France (2013); ‘Here Together Now’, Matadero Madrid (2013); ‘I am not dealing with triangle, square and circle’, Maçka Sanat Galerisi, Istanbul (2012); ‘Underconstruction’, Apartment Project Berlin (2012); ‘Second Exhibition’, ARTER, Istanbul (2010). peer is the anonymous contributor in this conversation who is excited about the inspiring practice of peer production, free culture and the related ideas along with their speculative potentials for contemporary art. This text is dedicated to the public domain by İz Öztat and peer in 2014. Posted in content, on artists and tagged peer, Sculpture for Rainwater Harvest, The Moving Museum, İstanbul, İz Öztat. Bookmark the permalink.